This dish can be served with pasta or your preferred starch - potatoes, rice, polenta, etc. We especially like it over buttered pasta with some extra Parmesan cheese on the side. This doesn't need any additional sauce - the Parmesan cheese and simple seasoning of salt, pepper and garlic powder was enough to carry it through. But if you are the sauce loving type, this works well with any red sauce or even alfredo sauce. Another idea that came out of leftovers was cutting the chicken up and serving over a salad - a great low carb meal! Place chicken between 2 sheets of plastic wrap and using a meat mallet, flatten chicken to a 1/2 inch thickness; set aside. In a medium shallow bowl, whisk eggs. In another medium shallow bowl, combine panko or flour, Parmesan cheese, salt, pepper and garlic powder on plate. Dip flatten chicken in beaten eggs to coat both sides. Then dredge chicken in breadcrumb or flour mixture, coating completely. In a large nonstick skillet over medium heat, add oil and heat. Place chicken in hot skillet and sauté until golden brown and cooked through, about 5 minutes per side. 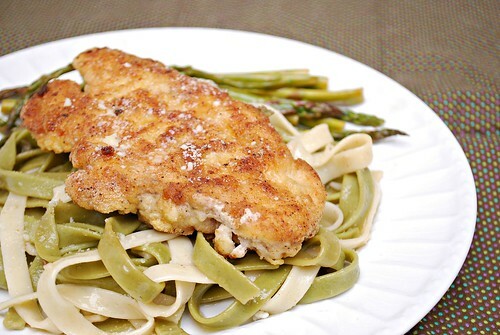 Serve chicken over pasta and sprinkle with lemon juice before serving. I served this over a mix of GF spinach and regular fettuccine. 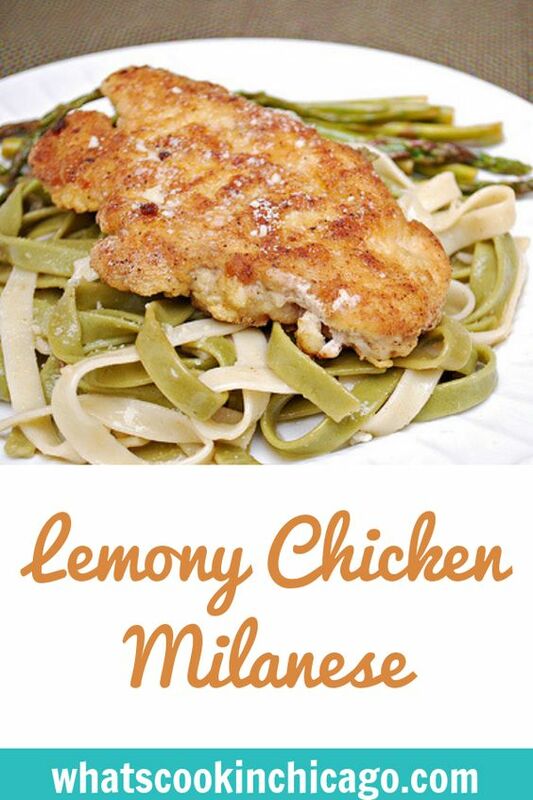 Your Milanese recipe looks great! I am going to have to try it. Thanks for sharing! I'm absolutely going to try this. So simple ands sounds device. Thank you. I am absolutely going to try this. It sounds devine. Thank you. Hi! Great website and recipe. Don't you do sugary food too? It is so nice that there are so many GF options now. This is my type of dish. Love the crunch from the breadcrumbs on the chicken and the lemon flavor.